Born on 9 August 1888 in Grevesend, England - husband of Katherine Woodford (later Robertson), Midaposi[? ], Alberta - at the time of his enlistment in 1915: trade as taxidermist; married; no current or previous military service; Church of England; height of 5 feet 7.5 inches; chest of 35.5 inches fully expanded; dark complexion; brown eyes; black hair. 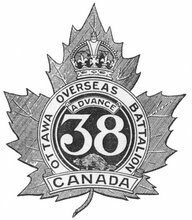 Joined the 51st Battalion, CEF, in Edmonton, Alberta, on 17 June 1915 (number 437447) - taken on the strength of the 38th Battalion, CEF, on 27 or 29 November 1916 - invalided sick to England on 14 January 1917 - repatriated to Canada - died of sickness on 15 September 1918 - buried in Calgary Union Cemetery (grave L.5.B.11.S.N. ), Alberta.